Monkey Island 2: LeChuck's Revenge is the second game in the Monkey Island series, and was released in December 1991. It featured a new inventory system with icons for items, which was later used in the original Monkey Island in it's VGA CD release. This game was darker than the first, which was reflected in the music and the atmosphere of the game. It was also the last game to be made by the original creators of Monkey Island, Ron Gilbert Tim Schafer and Dave Grossman. 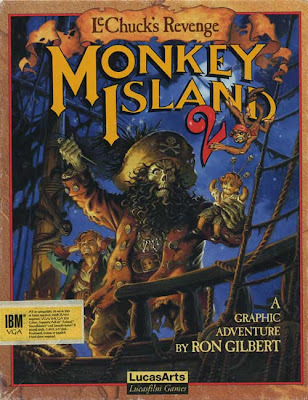 However, Dave Grossman would later make Tales of Monkey Island at Telltale Games with input during the early brainstorming sessions from Ron Gilbert. The original version had an easy mode, which was removed in the CD version and later Special Edition. The Special Edition was released in July 2010 and had new high definition graphics, music performed with live instruments, and voice acting. The VGA CD version of Monkey Island 2 is accessible in the Special Edition at the press of a button. The original datafiles can also be extracted to be used in ScummVM through the process detailed in this thread. All versions of Monkey Island 2 except for the special edition (although the original datafiles are supported if you extract them as detailed above) are now supported by ScummVM, a program designed to let 2D adventure games run on multiple platforms. With ScummVM, Monkey Island 2 now runs on modern versions of windows, as well as Linux, Mac OS X, and many consoles such as Dreamcast, Wii, PlayStation 2, and PlayStation Portable. For a complete list of platforms supported by ScummVM, see here. The retail versions are now out of print, but the digital versions of the special edition can still be purchased.